This has been one of our favourite projects to-date. Wendy and Neil are fantastic to work with. Do not mistake this for another ‘deals’ website, it is not that at all. 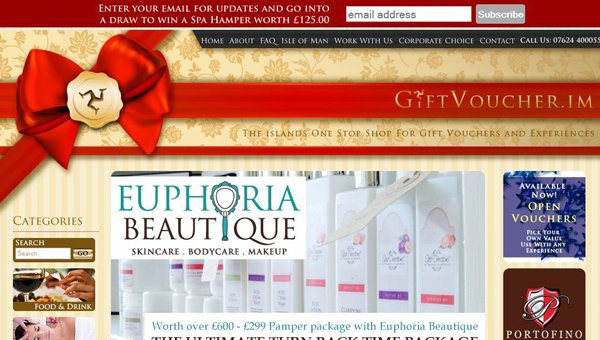 GiftVoucher.IM chooses Isle of Man companies who do not have online shop facilites of their own, but who do sell gift vouchers, and gives them the ability to sell via the giftvoucher.im website. There are already some pretty special experiences on there. Services: Strategy, Concept, Branding, Design, Stationery, Flyers, Leaflets, Banners, Print Management, Web, e-Commerce, Social Media, e-Newsletters, Hosting, On-going Consulting.